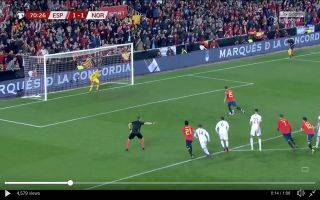 Real Madrid and Spain captain Sergio Ramos scored a lovely ‘panenka’ penalty for Spain in their 2-1 win against Norway this evening, Ramos is all about the style. Spain were awarded a penalty in the 70th minute of the clash when Chelsea and Atletico Madrid striker Alvaro Morata latched onto a poor pass back from a Norway defender, leaving the goalkeeper with no choice but to bring the forward down. Ramos was stone cold when he stepped up to the spot and after a little stutter step, the 32-year-old chipped the ball straight down the middle of the goal. Real Madrid fans will love to see that Ramos still has that air of confidence about him.